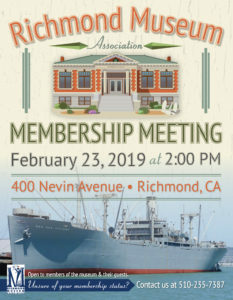 The membership of the Richmond Museum Association will convene for the annual meeting on February 23, 2019 at 2:00 PM. The meeting will take place at the Richmond Museum of History, located at 400 Nevin Avenue in Richmond, CA. The meeting is open to members and their guests.